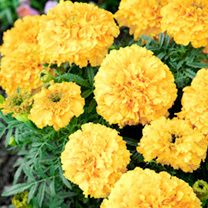 A low-growing marigold producing exceptional, large, golden yellow blooms with densely packed petals from June onwards. Has the benefit of odour-free foliage that some people do not like. Long-lasting in bloom. Height 30cm (12"). HHA - Half hardy annual. Suggested planting distance 30-35cm (12-14"). Ideal for beds and borders, patio pots and containers. Drought tolerant. Prefers full sun. Probably the most easily grown, yet productive of bedding plants, they will flower, with a little tender care, all summer long.